Escape the Room - Mysterie at the Stargazer's Manor. * A Party event for gatherings for 3 to 8 * Information It's 1869 and a well-known astronomer who resides in the Stargazer Manor has disappeared. It's up to you and your guests to find clues, solve challenges, save the astronomer and escape the room - before time runs out. This nail-biting party game is the first of its kind. You get all the excitement of the typical Escape the Room games and events, but this one you can play at your house without actually locking anyone in a room. Will you and your guests be able to solve the mystery and save the astronomer? This Thinkfun version of 'Escape the Room' is not too difficult. (+10yrs.) 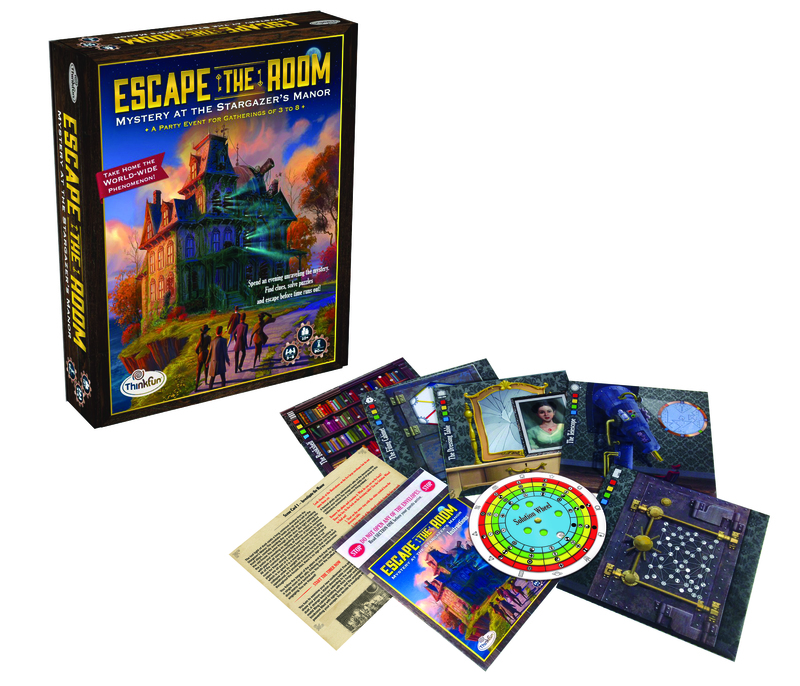 For a more Challenging Escape game, look for The Escape the Room "Secret of Dr. Gravely's Retreat", also from Thinkfun.